Our toddlers often take the central part of our hearts. So, when they unexpectedly pass away, we should accord them the utmost respect, the same way we do to men or women who die aged. We can use the funeral templates for kids to tell others about the sudden loss of a baby girl or boy, the unexpected demise of a lovely toddler, and a proposed plan to lay them to rest. There are many premium funeral templates that you can use, and below is a list of high-quality templates for you. 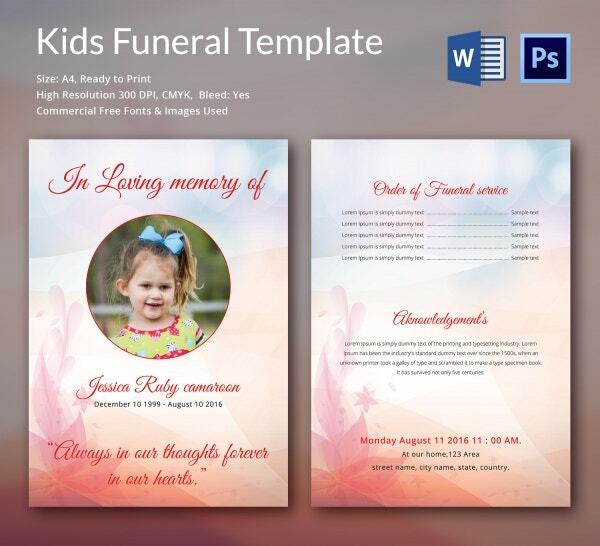 The funeral template for kids is a perfect document for writing a funeral invitation. Make the funeral invitation template as precise and focused as possible, and then distribute the invitation to friends and family members. 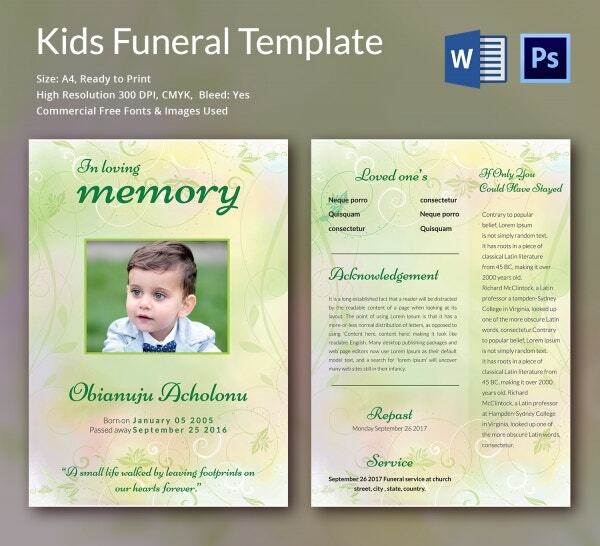 If you would like to create a funeral program for kids, you can use this template. The order of service is an outline of the activities that you will conduct during this event. The template is easy to edit and customize. You need a great order of service to conduct a successful funeral for kids. Use this template to write the best order of service. The template is easy and simple to customize, too. Writing an obituary of a dead kid is a good thing, and you can use this template to do so. You need to make sure the document reads well, and that it touches only on the most important part of a child’s story. The template is perfect for the funeral invitation as well as memorial prayer requests. 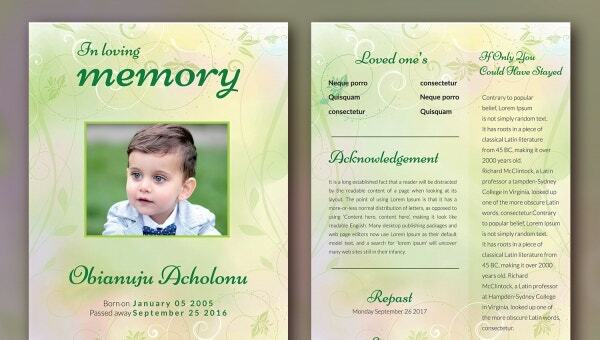 You can customize the template to accommodate both the prayer request and an invitation to the funeral. > Who uses this Template? This template is for a family that lost a lovely child; a mother who will no longer see her kid go to school, a father will never kiss his son or daughter again. It is the best piece of document that you can use as suggested. It is the best proof that a child is truly gone. 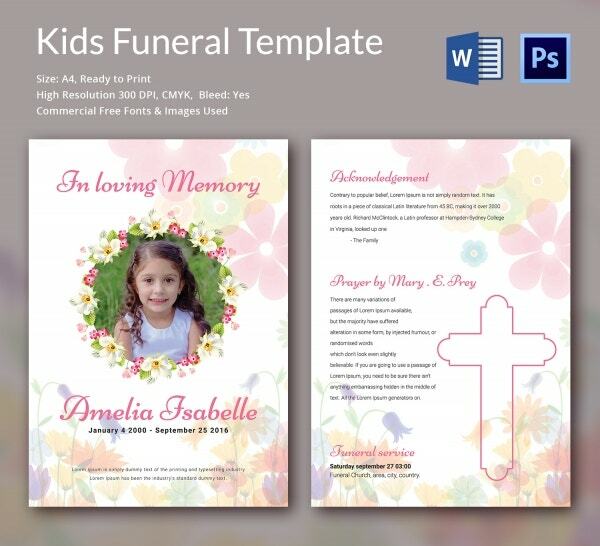 The funeral template for kids is the only source of information that you can use to convince people that loved your child and know the baby is resting in eternal peace. It is important to make the content of the document as precise as possible so that readers can easily understand. You can also see Mother Funeral Templates. 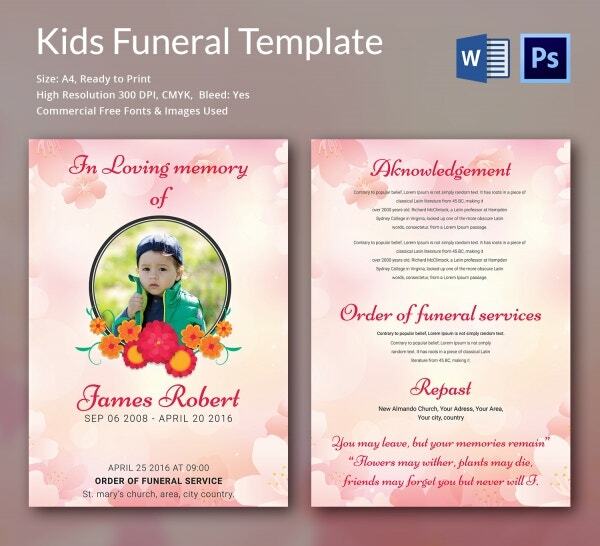 One of the benefits of the funeral template for kids is they are cheap. In fact, it is cheaper to download a premade template as opposed to hiring a designer to create one for you. 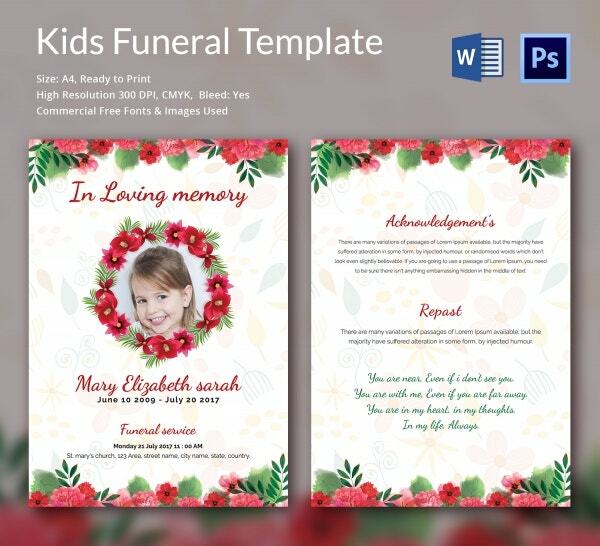 Moreover, the predesigned templates are easier to edit, which means even someone with the very basic computer skills can edit the template and use it to create the best funeral program for kids. A dead kid is a gift forever lost, but the special memories about them should never go into oblivion. While people come together to mourn the death of a loving child, that shouldn’t be just about it. It is important to make a funeral event a moment of motivation, too.